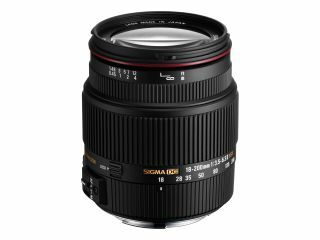 Sigma has announced the release of a new 18-200mm superzoom travel lens with built-in optical stablisation. The Sigma 18-200mm f/3.5-6.3 II DC OS HSM is the successor to the Mark I lens launched in June 2007. The new lens is specifically designed with travel photographers in mind, boasting a long focal range and a compact length of under 90mm. FLD ("F" Low Dispersion) glass elements and SLD (Special Low Dispersion) glass elements help to correct chromatic aberration. Aspherical lenses also promise to help correct aberration and distortion, while a Super Multi-Layer Coating reduces flare and ghosting throughout the zoom range. Sigma's optical stablisation system offers effective correction of approximately four stops, which can help with handheld photography and low-light shooting. A Hyper Sonic Motor (HSM) is included for quiet, high-speed autofocus, while the internal focus system eliminates front lens rotation. The lens is therefore particularly suitable for use with circular polarising filters. A rounded seven-blade diaphragm promises to create attractive bokeh in out-of-focus backgrounds. The new lens will be available in Canon, Nikon, Pentax, Sigma, and Sony mounts, and will cost £499.99 in the UK.